After getting a fever last Tuesday, I'm stuck on my bed till yesterday morning resting and for the love of god now I'm back on my feet and here announcing my first winners on my DiscOVIries promo. Yes you heard it right, winners as in more than 1. Its been a hard time to pick who among the entries are rightful for the prize. So I've decided to pick 2 winners. But before I got the two winners, I picked 5 finalists. And here are they. All of them made a good impact to me. And somehow some of them makes me laugh. 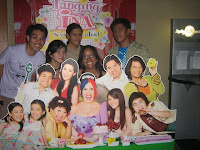 But I need to choose only 2 entries out of the 5 and I choose the entries of Azrael Coladilla and Winston Almendras. 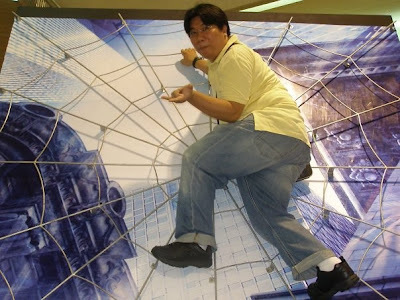 "it took me 30 minutes just to convinced a promo guy to use and climb a Spider-man 3 movie display set in SM Mall of Asia. I got lucky that they agreed and here's a photo of me pretending to be Spider-man without the costume. 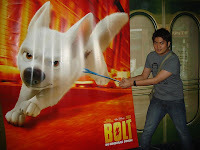 Then I realized that this movie promo set is for kids only hahahah," according to Azrael or Az to his friends on blogosphere. I choose his entry because of the creative pose combined with a ridiculous face gesture. And only a guy with guts can do that in public specially on a "for kids only" section. "Bean wants to discOVIr something from my friend's phone. 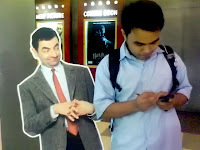 We took this photo during Mr. Bean's third movie. I always loved Mr. Bean's comic expressions." I can't agree more with Winston. Mr. Bean could be one of the most quiet man on earth but he never fails making me laugh with those facial expressions and wacky antics. With this simple photo, right positioning is the key and viola, a perfect Bean moment. wow! at least kasama pa rin sa Top 5! wink! thanks thanks jori! wohoo! !